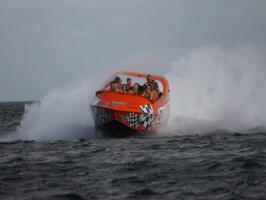 If you are a lover of speed, choose Playa del Carmen or Playa Blanca for a jet boat excursion around the coast. 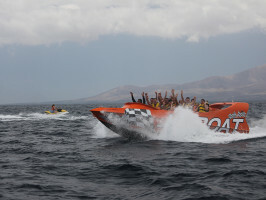 On a medium-sized high-speed boat accompanied by a fully qualified team, sail the waters and approach hidden corners of the coast. Hold on tight and enjoy an action-packed journey. 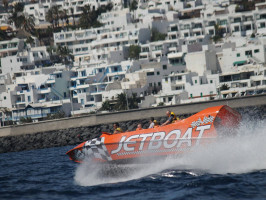 Surf the waves of southern Lanzarote with a jet boat ride. Adrenaline and fun guaranteed! 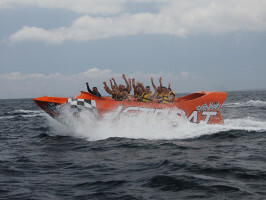 If you are a lover of speed, choose Playa del Carmen or Playa Blanca for a jet boat excursion around the coast. 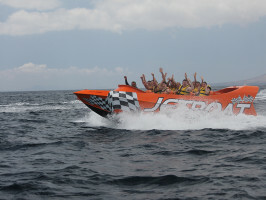 On a medium-sized high-speed boat accompanied by a fully qualified team, sail the waters and approach hidden corners of the coast. Hold on tight and enjoy an action-packed journey. Meeting point: Playa Chica, Paseo Barrilla in Puerto del Carmen and Marina Rubicon Port in Playa Blanca at the diving centre. 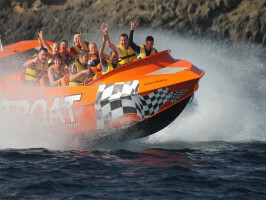 Others: Please note: In Playa Blanca the jet boat is only available for groups of six people or more. Participants must be aged 16 years or older. Opening days/period: Open to the public every day from 11am to 5pm all year round.